Cinderella may be a story as old as time. The handsome prince who falls in love with the girl who has to work as a maid at the behest of her evil stepmother. It's a tale every child knows famously put into animation by Disney. Over the past few years, there have been numerous attempts to bring animated Disney films onto live-action big screens. The results are always on the fine line between hit and miss - and for me 2015's "Cinderella" is one of the bigger hits. The film largely sticks to the age-old story. It doesn't try desperately to rejuvenate the story, add new twists and turns, and above all doesn't make it an over-the-top dark tale like so many of its contemporaries. 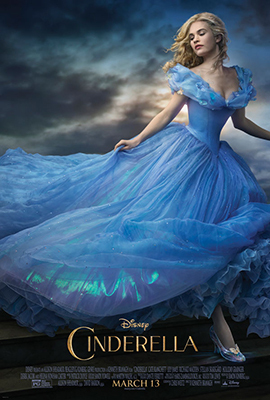 "Cinderella" is still the sweet old story we all know and love. It remains true to the source though it does add a few extras like Ella's happy childhood when her mother was still alive and how she learned her mantra that keeps her going through the difficult times, "Have courage and be kind". There may be a bit too much CGI at times, making Blenheim Palace look even more grand than it is - but in the end, my verdict is a good one: Cinderella is best as it is - and "Cinderella" achieves to portray that.